Product prices and availability are accurate as of 2019-04-20 12:33:40 EDT and are subject to change. Any price and availability information displayed on http://www.amazon.com/ at the time of purchase will apply to the purchase of this product. 1. 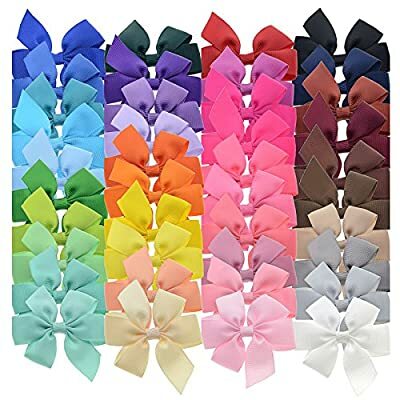 Our child hair bows size: 3", made by quality & environmental grosgrain ribbon, attached with 1.78" metal alligator clips, set of 40 solid colors hair bows: Black, white, green, yellow, blue, navy, ivory, purple, lt purple, pink, hot pink, lt pink, red, grey, silver, etc. 2. These small bows are glued with no teeth alligator clip, which is easier to slide into hair without getting stuck or caught. Their ends are very well made with no fraying ends or loose strings anywhere. 3. These pony hair accessories are perfect gift for baby shower, birthday and any holiday and party. 4. 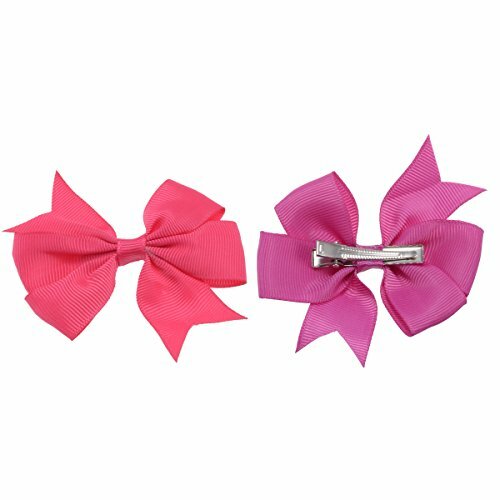 These kids barrettes are very popular among baby girls, little girls,toddlers,teens, kids, children,juniors, women etc. 5. 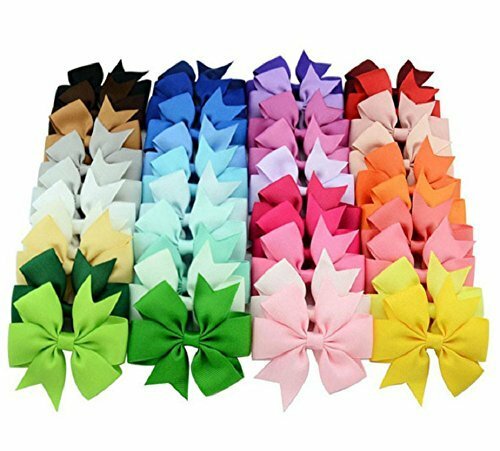 The fantastic variety of multi colors ribbon bows are so amazing and beautiful, set of great variety of colors to match your any outfit and uniforms. 6. 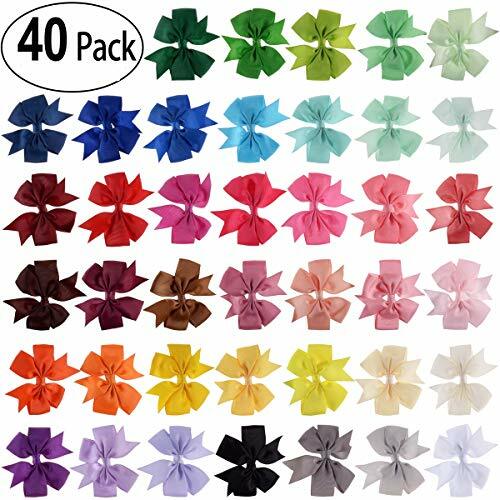 Package include: 40pcs hair bows with clips. 40 colors assorted as shown in the photo, each color 1 piece Made from first class quality grosgrain ribbon, perfect for keeping the shape of the bow These hair bows are made 3'' in long, high quality grosgrain ribbon and attached to partially lined single prong clip.These clips hold fine hair really well. The fantastic variety of colors are so gorgeous bright and beautiful. 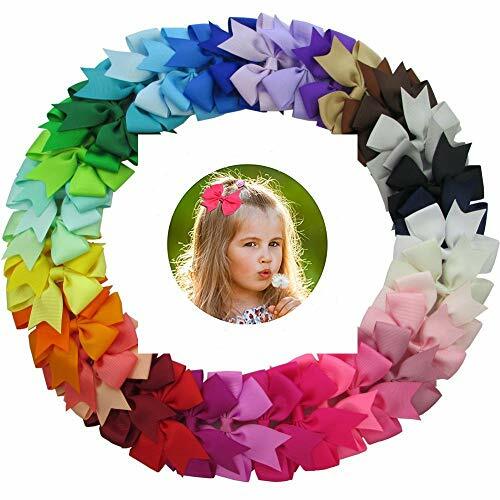 These girls hair bows stay in place and wear them comfortably.DC-BEAUTIFUL grosgrain bows ribbon bows go with any kind of clothing.You can wear them with dresses or down to a pair of jeans and a t-shirt,WARNING: Small parts can choke a child if they become detached, adult supervision required.